Fifteen years before I was diagnosed to have gallstones, I already felt pain whenever I eat fast. The pain also occurs when I don't eat for a while (4-5 hours) and then eat like a hungry animal. Blame it on my quest for a thin body. I would starve myself. Sometimes, I would just eat three pcs. of Skyflakes crackers when I feel hungry. And then go for another hour or two before eating a heavy, high-protein meal. Add to that is my diet of meat, soda, minimal vegetables and fruits, cakes and chocolates. I didn't know I was already a candidate for gallstones surgery. Anyway, as years pass by, the pain just gets worse until I had to be hospitalized. The pain is centered on the upper abdomen area, right above the belly button. That area gets hard and you could feel and hear gas bursting. You could literally feel your stomach throbbing. The pain is excruciating I could not utter a word. 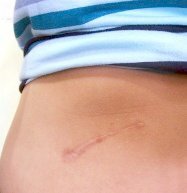 When I was hospitalized in 2006 because of the severe pain. I was only 29 years old. I was holding my abdomen while going out of my house to look for someone to bring me to the hospital. I guess the look in my face said it all: "bring me to the hospital now!" So if you have any of these pain that I just described, you could have symptoms of gallstones. I couldn't really remember what happens BEFORE I vomit. According to women's health websites, the vomiting usually happens after a fatty meal. Well, if every meal I eat is fatty, how would I know which one triggered the vomiting? Anyway, what I remember is the vomiting. It occurred less often than the pain on the upper abdomen, but it was worse. It was a horrendous ordeal since you know you have to vomit but it takes too long for the vomit to spill out. So in the process you don't breathe for a few seconds and so you fell like you're going to die. After vomiting, you feel like you're given a second life to live. Really. This is one gallstones symptom you don't want to experience ever in your life! Another gallstone symptom is abdominal bloating. This goes hand in hand with gas and belching. When you have gallstones, your stomach always feel bloated. One mistake of eating a fatty food like chocolate or coffee, you're sure to burp and fart and have the usual symptoms of indigestion. If you burp often, then it might be a symptom of a gallbladder problem. Luckily, I didn't get any of these advanced gallstones symptoms that would have required an emergency gallstone surgery. Nevertheless, I had my gallstones removed through open surgery months after I was diagnosed. Aside from the severe pain, I was advised by my surgeon (who also went gallstone surgery) not to wait until I get jaundice before I decide to have surgery. Jaundice or yellowing of the skin and eyes is already a symptom that the gallbladder is blocked and the liver is seriously damaged. And I didn't want that to happen! Do you experience any of the gallstones symptoms and want to try an alternative way to flush these stones without surgery? Then you might want to read the Liver Flush method. It not only cleanses your gallbladder but your liver and intestines as well. It's an inexpensive and natural liver detoxification method. Click here for the Liver flush! More information about me and why I built this website. Return from Gallstones Symptoms to Liver Detox DISCLAIMER: No part of this document is intended to diagnose or treat any disease.